P-MEC India is one of India’s largest pharmaceutical exhibitions where domestic and international pharmaceutical experts meet to network and shape the future of the Indian and South East Asian pharmaceutical industry. This year P-MEC India is taking place from 12 – 14 December 2018 at India Expo Centre, Greater India, Delhi NCR, allowing companies from all over the globe to showcase their latest trends and technologies in the pharmaceutical industry. 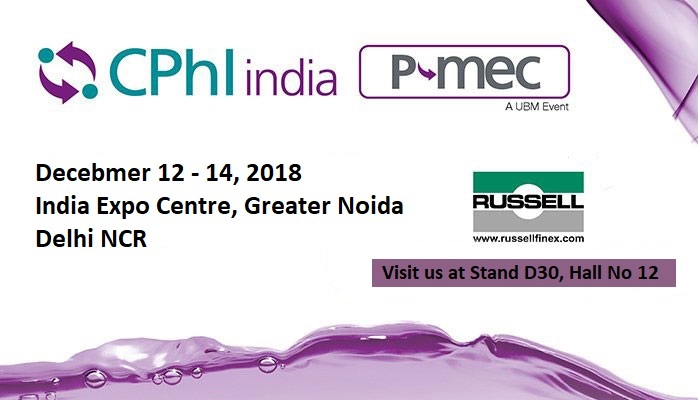 Russell Finex is participating for the fourth time in this exhibition and will be located at Stand D 30, Hall No.12 with their high-performance pharmaceutical sieving and separation equipment. Visitors will have the opportunity to explore live demonstrations of the machinery and meet experienced sales engineers at hand to help choose the best solution for your unique requirements. The Finex Ultima™: The revolutionary vibro screen, exclusively available for India, Sri Lanka and Bangaldesh is designed to handle multiple sieving processes including accurate grading, screening, dewatering or sizing of wet or dry applications. The Russell Compact Sieve®: This is a versatile high capacity vibro sifter designed for check-screening many pharmaceutical applications. Its compact size allows it to fit easily into existing production lines without occupying extra space. The Vibrasonic® Deblinding System: This ultrasonic deblinding sifter helps to prevent mesh blinding while sieving difficult pharmaceutical powders on finer meshes down to 20 microns. This unit helps to increase screening capacities and product flow, resulting in improved productivity. Contact us to find out more about the high-performance screening and separation solutions available for the pharmaceutical industry.